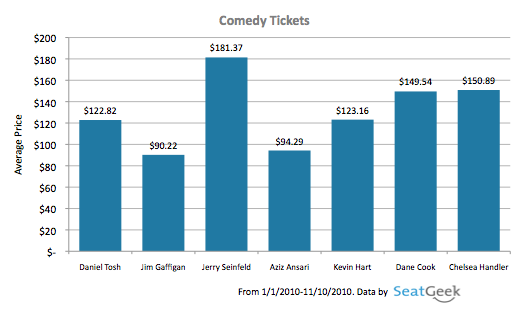 You haven’t seen us discussing Comedy much here, but if you’re in search of humor SeatGeek has a ticket for you. 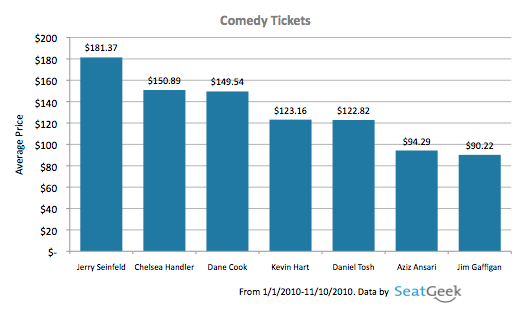 We’re proud to let everyone know that comedy tickets are available on SeatGeek and will now be covered here on the Blog moving forward. Bro out with Daniel Tosh, impress a date with your self-aware sense of humor at a Jim Gaffigan show (don’t forget your Hot Pocket) or go retro with comedy legend Jerry Seinfeld. If these ticket prices are a joke in themselves to you, check out Jim Gaffigan in New York for $56 or Chelsea Handler the same night in New Jersey for $74 (prices as of 11/10), and if you can’t make those shows check out Today’s Big Thing for your daily dose of youtube humor. Share your favorite jokes and one liners in the comments or tweet us @SeatGeek.